As one landscape-altering, pocket-sized entertainment phenomenon was being announced to the world by Steve Jobs, a teenage Lionel Messi cut a frustrated figure, sidelined with a fractured metatarsal in his left foot. Despite his declaration that Apple was going to "reinvent the phone", Jobs' hopes for his new product were relatively modest: 10 million units sold, and a one per cent share of the mobile-phone market by the end of 2008. That target was met comfortably. For Messi, having already missed seven months of football in his first three seasons, the objective was simply to gather some momentum. That December, he was voted runner-up in the Ballon d'Or behind Cristiano Ronaldo. Escape velocity reached, both continued their upwards trajectories. By the end of 2012, Apple had sold well over 300 million iPhones, while Messi had won four consecutive Ballon d'Or trophies. There was some neat symmetry to their unstoppable rise: as Messi cruised to his historic 73-goal haul in the 2011-'12 season, Apple was hoovering up 73 per cent of the smartphone industry's profits. Well over a decade on from entering their respective markets, with legacies sealed and fan bases unwavering, for Messi and the iPhone, it is about evolution over revolution: a button removed here, a switch to the right side of Barcelona's attack there. Messi turns 32 in June, but there are remarkably few signs that his endlessly renewing code has been cracked, no apparent symptoms of 15th-season syndrome, and no immediate prospect of him being put out to pasture in a less-demanding league. 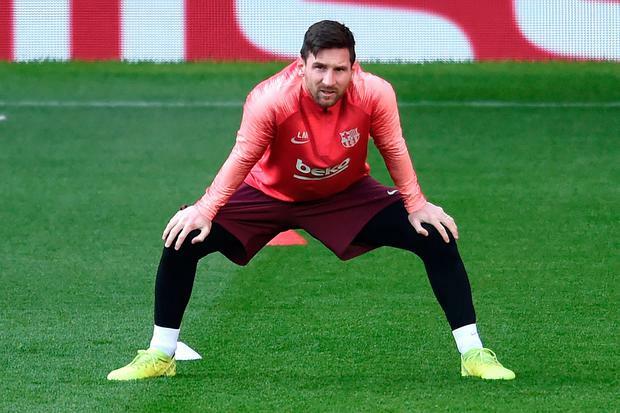 Compared to the twisting ball of perpetual motion they faced in the Champions League finals of 2009 and 2011, Manchester United will face the more calculated 2019 edition Messi at Old Trafford tonight. While Apple is now struggling to find new boundaries to push (quite literally, since 2017's iPhone X went full-screen and ditched the oddly comforting home button), Messi has begun to specialise. He has scored seven free-kicks this season, equalling his own record with a possible 13 more games to go. He has scored 20 times from dead-ball situations in the past five seasons (his nearest rival in Europe's top five leagues, Miralem Pjanic of Juventus, has 11). It also appears that Messi is finally letting the ball do the work. His latter-years decline as a dribbler (he completes 19pc fewer dribbles compared with his average since 2009) is mitigated by his renewed threat from distance: he is attempting more shots from outside the box than ever. Messi's creative side has evolved in much the same way, resulting in a 69pc increase in accurate long passes and 27pc more goalscoring chances for team-mates. Cold, hard data aside, it feels like Messi's appeal is immune to the concept of saturation point. The cliché has persisted for what feels like a decade now that we are "running out of superlatives" for him. And yet, 15 seasons in, we still have the Pope, himself, feeling compelled to remind Spanish TV last week that "of course, Messi is very good, but he isn't God". Familiarity and contempt are frequent footballing bedfellows - United's domestic dominance of the Nineties, for example, is a prime case study for that. But who among us is sick of the sight of Lionel Messi? Against Real Betis last month, he produced the 681st, 682nd and 683rd goals of his career, but nothing about his 51st hat-trick felt at all stale. That precious left foot, once fractured, now conspired to bend a gorgeous, replay-demanding free-kick into the top corner. Then it poked home an impish finish with three defenders scrambling behind him like early adopters at the Apple store on release day. Finally, and most virally, it span the ball over the grasping glove of goalkeeper Pau Lopez from the edge of the box, leaving two team-mates with heads in disbelieving hands and the supporters - the Betis supporters - chanting his name. What the plateauing smartphone market would do for such evergreen enthusiasm for its products. For the first time since 2012, he is hovering back above the goal-a-game ratio, heading once again for the rarefied air of the 50-goal season. Meanwhile, Apple - for the first time since Jobs unveiled the very first iPhone - has decided it will no longer disclose how many units it sells. That tacit admission that saturation point is closing in makes the unrelenting brilliance of Messi look even more of a miracle. And, if the Argentinian has his way, there is more to come, with another Champions League success very much on his agenda. Barcelona are 16 matches unbeaten in all competitions and it seems a case of when, rather than if, they wrap up a 26th Spanish title. Also through to May's Copa del Rey final against Valencia, they are 11 points clear of Atletico Madrid in La Liga after scoring twice late on to beat their nearest rivals 2-0 last Saturday at the Nou Camp. On the road, Barca are unbeaten in eight away matches in all competitions and have lost only three times all season. They beat Tottenham 4-2 at Wembley and drew 1-1 with them at the Nou Camp as they won Group B ahead of Mauricio Pochettino's side, before securing a 5-1 aggregate win against Lyon in the round of 16. Yet, they have not gone beyond the quarter-final stage of the Champions League since winning the competition in 2015, infamously surrendering a 4-1 first-leg lead against Roma last season to exit 4-4 on away goals, and it was only a week ago that they drew 4-4 against Villarreal. Barcelona must plan without Ousmane Dembele, who has been ruled out because of the thigh strain that has sidelined him since mid-March, and Thomas Vermaelen.